Home / News & Events / How many people support climate change education in your county? Now you can find out. How many people support climate change education in your county? Now you can find out. As discussed in our recent Climate Note, an overwhelming majority of Americans in every single county in the United States think that we should teach children about the causes, consequences, and solutions to global warming. We are pleased to announce that we have now incorporated this question into the Yale Climate Opinion Maps. This tool was recently shared by YPCCC Research Scientist Jennifer Marlon and Research Associate Abigail Cheskis, during a webinar with the Climate Literacy and Energy Awareness Network (CLEAN). 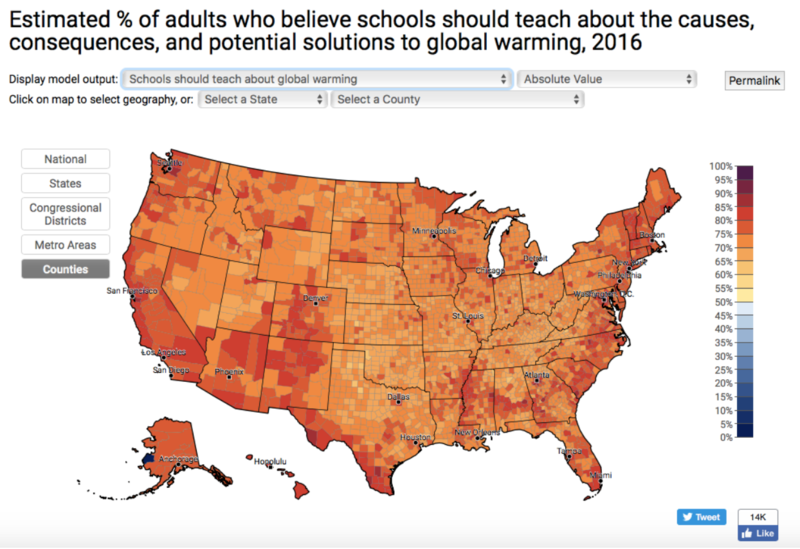 You can explore opinions about climate change education in states, Congressional Districts, counties, and metro areas using the Yale Climate Opinion Maps. Check it out to discover what people think in your area. For more information about how these maps were created, please see our methodology.